We offer air duct cleaning, dryer vent cleaning, and chimney cleaning services to Washington DC, Northern Virginia (including Arlington, Alexandria, Fairfax, Herndon, McLean, Tyson’s Corner, Woodbridge) and Maryland (including Annapolis, Baltimore, Bethesda, Catonsville, Columbia, Crofton, Ellicott City, Gaithersburg, Glen Burnie, Potomac, and Silver Spring). Review our portfolio to view the ever growing list of residential and commercial clientele we have had the honor to serve. We are recognized by our clients as dependable, educated and honest air quality service providers. Please complete the quote request form and one of customer service representatives will contact you promptly. 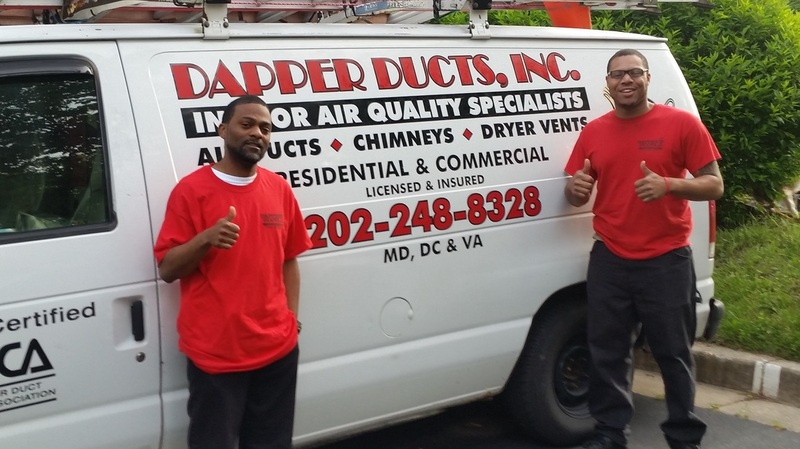 Dapper Ducts, Inc. the leader in indoor air quality for Washington DC, Northern Virginia and Maryland. Dapper Ducts, Inc. is a family run company with more than 10 years of experience performing air duct cleaning, chimney cleaning and dryer vent cleaning for residential and commercial customers. We are certified by the National Air Duct Cleaners Association (NADCA) and our cleaning methods are done strictly according to NADCA guidelines. Our equipment meets the highest, most advanced standard in the industry. We strive to educate the consumer about the importance of indoor air quality, and the benefits of maintaining clean air ducts, dryer vent ducts and chimneys. We want to be sure customers are informed and choose a reputable company and we hope to earn your business. Dapper Ducts, Inc. offers commercial and residential clients air duct cleaning, dryer vent cleaning and chimney cleaning services at affordable rates; each job is performed by a certified technician who is educated and knowledgeable in the air duct cleaning industry. No job is too small and we won’t sell you a service you don’t need. We serve all clients with the same dedication and goal in mind: improving your indoor air quality.